There are some changes to a small number of services taking place on 6 November, most of which are to improve reliability. A summary of the changes is below, along with the new timetables. There will be changes to improve the reliability of the service. Monday-Friday peak time journeys will continue to run at the current frequency. During Monday-Friday off-peak times, buses will now run every 12 minutes to improve reliability. Saturday service will continue to run every 10 minutes, with minor changes to some times. No changes to the Sunday timetable. To improve reliability, service 2A will no longer run around the loop of Fallowfield Way in Fatfield, instead running via Biddick Lane. Connections 4 will continue to serve Fallowfield Way up to every 10 minutes. There will be some small changes to the times of the service to reflect this amended route. There will be some minor changes to the timetable of service 5 to improve reliability. In Jarrow Bus Station, service 5 will now depart from Stand C.
We will be adding more journeys at peak times between Jarrow and Sunderland, with the frequency increasing to every 20 minutes. To improve reliability, the frequency of the service during Monday-Saturday daytimes will be revised to run every 20 minutes between Jarrow and Sunderland, with the service between Jarrow and North Shields continuing to run every 30 minutes. During on Monday-Saturday daytimes, the through service between Sunderland and North Shields will run hourly. In Jarrow Bus Station, the service will now depart from Stand B towards Sunderland. Journeys towards North Shields will continue to use Stand D as now. Due to low passenger numbers, the journeys from nPower at 4.44pm, 5.07pm and 5.48pm to Houghton-le-Spring on Monday-Friday will be withdrawn. Passengers can continue to travel on other earlier or late journeys on service 20A. There are no changes to any other times or journeys. Monday-Friday journey from Doxford International at 5.36pm towards Sunderland retimed to 5.39pm. Monday-Friday journey from Doxford International at 6.04pm towards Sunderland retimed to 6.06pm. There are no changes to the times of any other journeys. There will be some minor changes to the timetable of service 50 to improve reliability. A later journey will also be introduced from Durham on Sundays on service 50. The following journeys will be retimed to improve reliability. 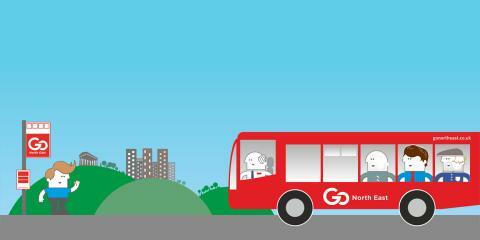 Monday-Friday journeys at 2.10pm and 2.22pm from Sunderland will run up to two minutes earlier. Sunday morning journeys at 8.05am from Sunderland and 9.15am from Newcastle will run up to 5 minutes earlier. There will be some changes to the timetable of Drifter 60 on Monday-Saturday daytimes to improve reliability. A small number of journeys in the morning and early evening are withdrawn or retimed due to low passenger numbers. Some early morning journeys will no longer serve Sainsbury’s car park, with passengers being advised to use Galleries Bus Station. All evening journeys are numbered 82, and are slightly retimed to improve connections with Red Arrows X1 from Newcastle. All Sunday journeys will running as service 82 or 82B, with service 82 serving Portmeads and service 82B running via Rickleton and Harraton. Nexus are making changes to this service to improve reliability. Monday to Friday morning and evening peak journeys are significantly revised, with minor changes to the timetable at all other times. The service will no longer serve the Airport internal roads, instead serving bus stops on Ponteland Road adjacent to Airport. At Killingworth Bus Station journeys towards Four Lane Ends will now depart from stand B and journeys towards Kingston Park now depart from stand C.
The 7am journey will no longer run.